Living in a foreign country, one may experience some anxiety and inconvenience. To help free JSPS Fellows of such encumbrances and allow them to concentrate on their research work, JSPS publishes the handbook “Life in Japan for Foreign Researchers,” and distributes it to Fellows prior to their departure for Japan. 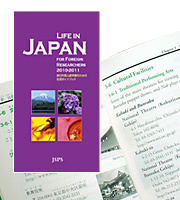 This 230-page volume, printed in both English and Japanese, contains useful information on such subjects as living, working, banking, housing, and receiving medical services in Japan. Please keep it handy during your tenure in Japan.